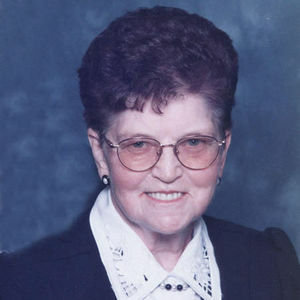 Lucylle A. Schmitt, 83, Moorhead, MN, formerly of Wahpeton, ND passed away Monday, September 9, 2013, at Eventide Lutheran Home in Moorhead. The Mass of Christian Burial will be on Thursday, September 12 at 10:30 AM at St. John's Catholic Church, Wahpeton, with Rev. Dale Lagodinski as celebrant. Visitation will be on Wednesday from 5 PM to 7 PM with a prayer vigil at 7 PM at Willow Creek Chapel, Wahpeton. There will also be visitation one hour prior to the service at the church. Interment will be at Calvary Cemetery, Wahpeton. Arrangements are entrusted to Vertin-Munson Funeral Home, Wahpeton. Lucylle Ann (Lucy Nordick) Schmitt was born on December 5, 1929 at Wahpeton, ND to Ferdinand and Taleeta (Buss) Smith. She grew up on the family farm where she was born and raised. She attended school in Mooreton Township and was assistant leader of the Fairview Lassies 4-H Club for 4 years and was a member of the Abercrombie Homemakers Club for 9 years. On October 5, 1948, she was united in marriage to Raymond Nordick at St. John's Catholic Church in Wahpeton. They resided on a farm near Brushvale, MN until his death in July, 1966. Lucylle moved into Wahpeton with her two sons, where she attended college, graduating from NDSCS in 1969. She worked in the Continuing Education Division as a secretary at NDSCS for two years and a receptionist at Dakota Clinic until becoming disabled from the aftermath of Polio. She was united in marriage to Mark Henry Schmitt on November 29, 1969, at St. John's Catholic Church. They made their home in Wahpeton. Mark retired in 1997; the couple purchased a lake home near Ottertail Lake, MN. Lucylle loved to fish and many days were spent on the dock enjoying the lake. Due to health problems, they moved to Breckenridge, MN, to a handicapped home. In 2011 they moved to Moorhead, MN, residing at Riverpoint and Eventide. Lucylle was a member of St. John's Catholic Church, Wahpeton; St. Lawrence Church, Perham, MN, Christian Mothers, Eagles Auxiliary, Breckenridge Senior Citizens, Center, a member of the Polio Connections of America and NINDS (National Institute of Neurological Disorders and Strokes) on the research of the brain and nervous systems. She loved doing crossword puzzles, crocheting, working with plastic canvas, making greeting cards and doing crafts. The last years she was busy making quilts. She enjoyed having her grandchildren stay with her and help with baking. She was well noted for her donuts and caramel rolls. She baked for Norwest Bank on Social Security days for many years. Her biggest achievement was baking wedding cakes for family and friends and making all the flower arrangements. She was called the "Cookie Lady" by her little friends down the street. Lucylle is survived by her husband, Mark, Moorhead; her two sons, Bruce (Debra) Nordick, Bemidji, MN; Kevin (Jo) Nordick, Fargo, ND; her daughter, Tammy (James) Olsen, Brooklyn Park, MN; 9 grandchildren and 8 great grandchildren, her sister Sharon Tetzloff; and two brothers, Lester Smith and Marlyn (Ethel) Smith, all of Wahpeton; one sister-in-law, Joan Smith, Nampa, ID, and many nieces and nephews. She was preceded in death by her parents, Ferd and Taletta Smith; her husband, Raymond; her son, Vernon; daughter, Cynthia; two brothers, Louis and Lyle; two sisters, Viola Dauer and Audrey Robert; three brothers-in-law, Gerald Tetzloff, Harold Robert and John Dauer. The beautiful and interactive Eternal Tribute tells Lucylle's life story the way it deserves to be told in words, pictures and video.